It has all the ingredients of a primordial soup. What’s more, the chemicals of life – discovered in a pocket of water that last saw the light of day 1.5 billion years ago – appear to have formed without any influence from biological processes. That means the idea that life got started as a result of chemical reactions around deep-sea vents looks more likely. Barbara Sherwood Lollar at the University of Toronto in Ontario, Canada, and her team discovered the water a few years ago oozing from rocky fractures 2 kilometres below the surface at the Kidd mine near Timmins in Ontario. The water, which is about 1.5 billion years old, appears to show no signs of life – an extremely rare find . The rocks are the ancient remains of hydrothermal vents formed at the bottom of Earth’s early oceans, and that means the water they contain could reveal important details about the chemistry that might have occurred at such vents before life began exerting its influence. 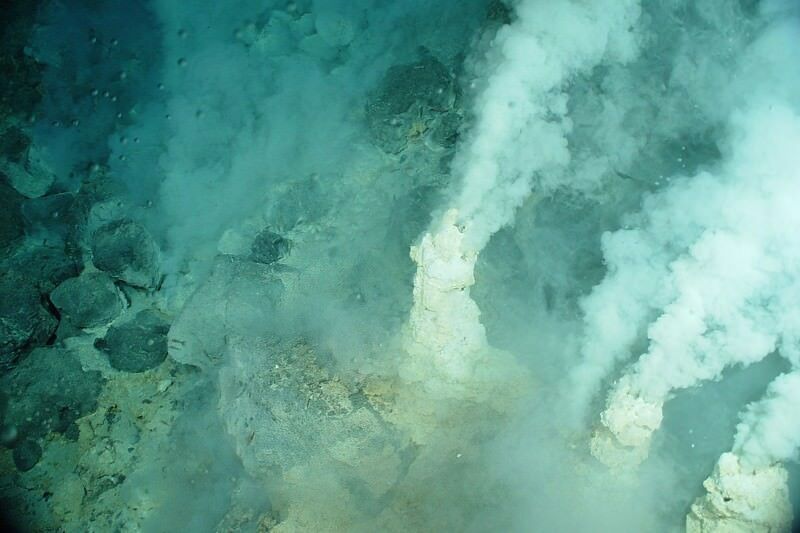 Hot, chemical-laced water gushes out of deep-sea hydrothermal vents – conditions that in theory would be ideal for the origin of life. But it is a difficult idea to test. “The chemistry is often heavily overprinted by life,” Sherwood Lollar says. Her team has previously found a wealth of complex organic molecules in the water. Now her colleague, Christopher Glein, has performed a raft of calculations to show that all of those molecules could have formed through perfectly feasible abiotic chemical reactions in the conditions found in such ancient hydrothermal vents. His calculations show the conditions were particularly favourable for the formation of some key chemicals, including glyceraldehyde, one of the precursors of RNA and DNA, and pyruvate, which is important for cell metabolism. Traditionally, biochemists have considered these molecules to be relatively hard to generate abiotically, says Glein who presented his findings at the Goldschmidt conference in Prague this week. “But that’s assuming they are being synthesised under familiar conditions at Earth’s surface,” he says. Conditions are very different in the ancient hydrothermal vents, they found. The water there has reacted with the rock through a process called serpentinisation to create an environment poor in oxygen but rich in hydrogen, iron and sulphur. Combined with temperatures of about 100 °C – also found there – many complex organic compounds can easily form. William Martin at the University of Düsseldorf, Germany, says hydrothermal vents would have allowed for even more complex things to form. “I say that hydrocarbon synthesis at serpentinising systems is enough to make even the first membranes,” he says. Glein emphasises that the water pockets in Kidd mine, while ancient, are not as old as life on Earth itself.